Shanghai (AFP) – Nico Rosberg roared to pole position for Mercedes after holding off a furious challenge from a resurgent Ferrari in Saturday’s qualifying for the Chinese Grand Prix. The German, who won the season’s first two races, is joined on Sunday’s front row by Red Bull’s Daniel Ricciardo after a late burst left Ferrari’s Kimi Raikkonen and Sebastian Vettel on the second. World champion Lewis Hamilton will start at the back of the grid, however, after mechanical failure effectively dashed the Briton’s hopes of a hat-trick of wins in China. “The pressure was on,” Rosberg told reporters after qualifying, which was delayed for 20 minutes after Pascal Wehrlein crashed his Manor into a wall moments into the first session. Raikkonen had looked set to claim his first pole since 2008 until a mistake at the hairpin left Rosberg celebrating his first of the season after being out-qualified by Hamilton in Australia and Bahrain. Ricciardo surprised even himself with his late heroics. 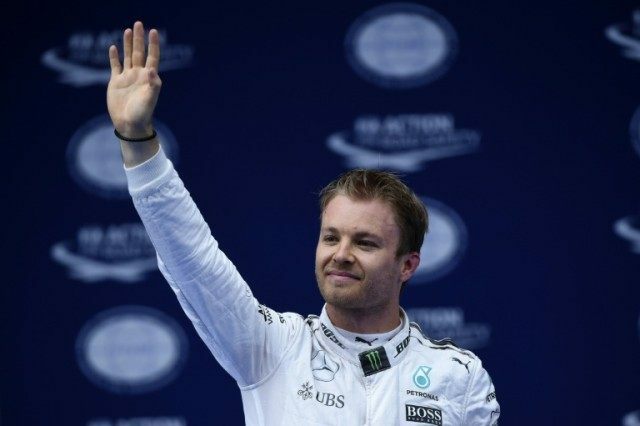 Rosberg will be favourite to claim his 17th career victory on Sunday and become only the fourth driver to win six Formula One races in a row after taking the last five chequered flags dating back to last year. But Ferrari, who have struggled with reliability this season, have shown blistering pace in Shanghai. Vettel insisted it was still game on, despite Rosberg making it three poles in a row for the Silver Arrows. Hamilton, who will switch engines for the race, battled his way up to third in Hungary two years ago — the last time he began at the back — but was philosophical about a repeat performance. “To get up to third, I think, is a very tough challenge,” he said. “The Red Bulls are quick, there’s the two Ferraris and there’s Nico, so just getting points is my goal. Former world champion Fernando Alonso, cleared to race this weekend after fracturing ribs in a horrific crash at last month’s season-opener in Melbourne, starts from 12th.